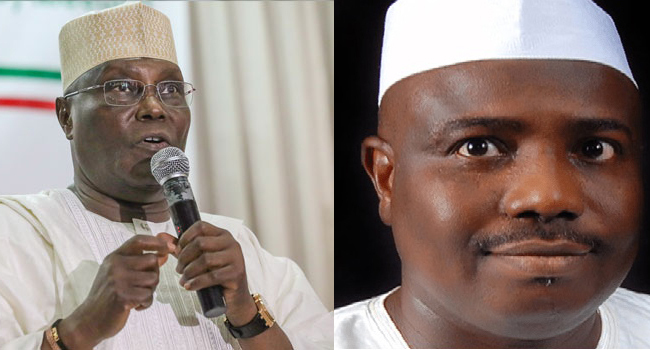 Former Vice President Atiku Abubakar has congratulated the Governor of Sokoto State, Aminu Tambuwal on his re-election. Atiku who took to Twitter on Sunday to congratulate Tambuwal believes the people made the right choice as he is the candidate that “will see them continue on the path to peace, progress and prosperity”. Tambuwal was declared the winner of the governorship election on Sunday, a day after supplementary polls were held. The PDP candidate polled a total of 512,002 votes after the 25,515 votes he got from the supplementary elections were added to the number of votes from the first exercise held on March 9. His closest rival, Ahmad Aliyu of the All Progressives Congress (APC) polled 511,660 after his 22,444 votes from the supplementary election were added to that of the March 9 election.